Patient Account Specialist is responsible for auditing the patient records and ensuring that it is accurate and complete in all ways. 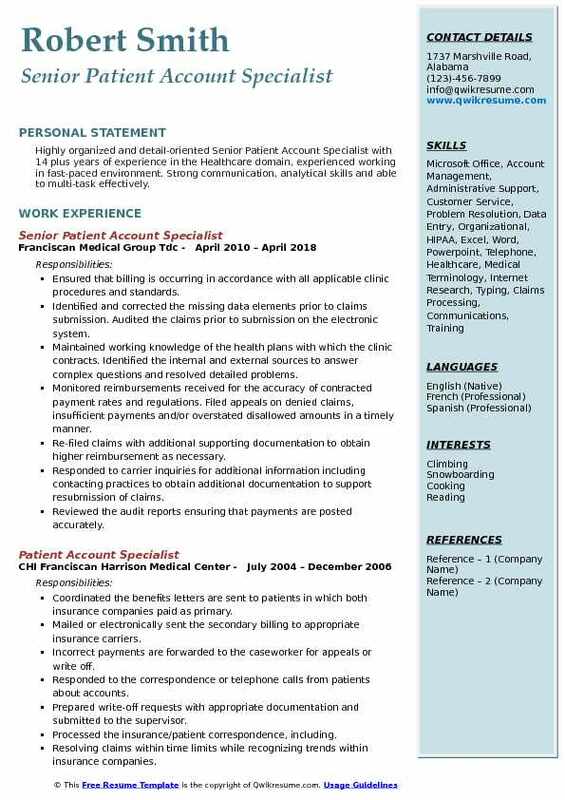 A well-crafted Patient Account Specialist Resume should demonstrate the following job description – managing patient account for documentation purpose, performing tasks pertaining to patient care or third party reimbursements, receiving medical records and reviewing the same, collecting necessary documents for auditing files and proofreading, resolving errors with patients, employees and referral sources, maintaining accuracy and quality control of inputs, obtaining re-certifications and re-authorizations, rendering assistance for overdue or not paid status accounts and offering all other assistance as required. The preferred qualifications for this job role are – knowledge of medical terminology, medical billing, and medical software; experience in administrative record and medical field record management and strong customer service background. With a High school diploma and knowledge of billing reimbursement, any candidate can seek this job employment. Summary : Patient Account Specialist III with 20 years of experience in the Healthcare domain is seeking to work part of a dynamic team in a reputable company where hard work & sincerity are appreciated and enhance the skills I already have. Within contractual and regulatory specified time frame, assembling the required documents, reviewing bills for edits and accuracy of charges and preparing the billing report for submission to the electronic operator. Ub04 claims are mailed to the appropriate payer in accordance with departmental procedure. Entering insurance and patient information in Cerner millennium and series in accordance with departmental procedure. Contacting other hospital personnel, as necessary to obtain information to assist in accurate and timely claim submission. Maintaining and demonstrating current knowledge of changing procedures and information necessary to produce accurate claims. Working about 100+ inpatient/outpatient EOBs a day in conjunction with contractual agreements with Aetna, Cigna, Oxford/UHC and United Healthcare. Also, commercial insurance companies include Qualcare, Magnacare, and PHCS discount. Refund request is written up due to insurance over payment and sent to finance department. Payment transfer is written up due to incorrect payment to the wrong account and faxed to cashier department. Patient transfer is also written up to upheld patient refund, which can be transferred to one or more accounts if the patient had other dates of service, which are then forwarded to credit department. 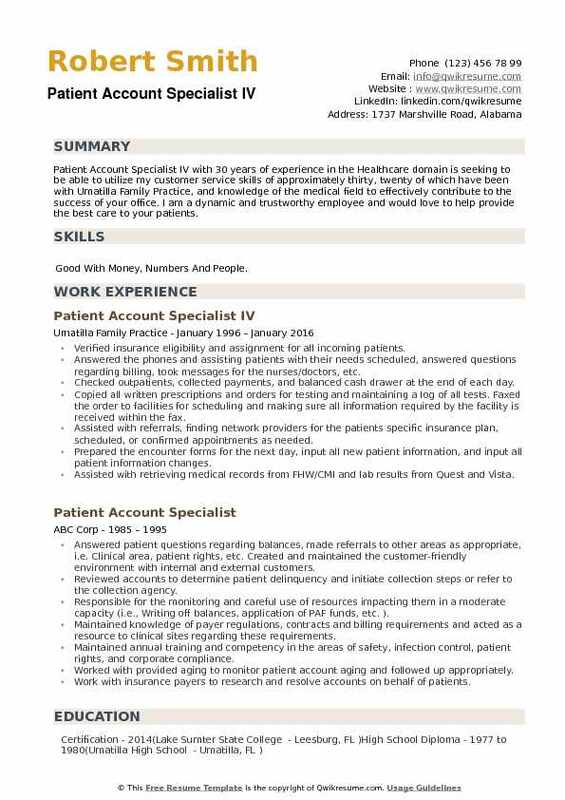 Objective : Junior Patient Account Specialist with 4 years of experience in the healthcare domain is seeking to obtain a position that will allow me to utilize my skills and experience. As well as enhance my skills with opportunities for advancement. I have strong verbal and problem solving skills, able to adapt to any situation, very disciplined, a self-starter and have a dedication to succeed. Reviewed all assigned accounts to ensure that all information, codes, and other relevant information are correct and charges have been billed within guidelines. Followed-up on all billed claims in a timely manner to ensure accurate, timely payment and disposition of account according to the payer contract or guidelines. Edited and processed claims efficiently, identified errors and rejects, resolved billing problems. Researched system and billing issue trends that prevent claims to go out to be processed. Followed up with patient families regarding account status; determined appropriate disposition, i.e., wrote off bad debt, forwarded to the collection agency and referred the patient family for financial assistance. Followed up with providers when claims need additional coding and information. Collected and posted the patient family payments and forwarded any reduction payments to be posted. Reviewed and resolved the reduction request submitted by any law firm in a timely manner. Managed own workload by applying an understanding of team priorities, provided assistance to less experienced colleagues. Worked independently and effectively managed time and resources to ensure that work is completed efficiently. Set high standards of performance, assumed responsibility and accountability for successfully completing assignments or tasks. Used systems such as Microsoft office suite, Epic, thrive(formerly med assets) health logic, payer sites etc. 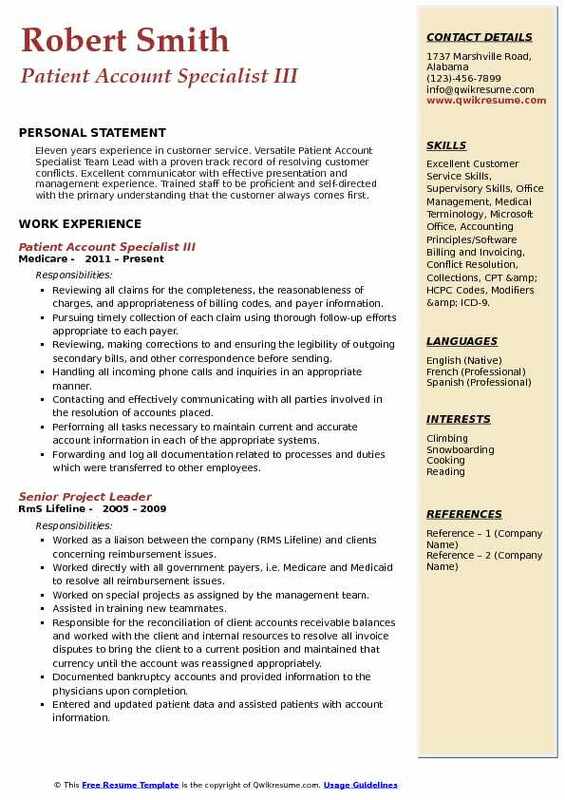 Summary : Patient Account Specialist I with 13 years of experience in the Healthcare domain, is seeking to take the skills and expertise I have gained in my career in the legal field and apply them to a different workplace. I am excited about having an opportunity to further develop my skill set and expand my education. Skills : Creative Problem Solver, Detail-oriented, Exceptional Communication, Exceptional Time Management, Strategic Sales Knowledge, Strong Interpersonal, Credit Card Processing, Skilled In Call Center Operations, Strong Client Relations, Call Center Metrics, Decoding, Aptitude, Goal-oriented, Inbound Calls, Active Listening, People-oriented. Greeted the patients and provided assistance to patients when contacting payers directly, utilized approved scripting. Obtained accurate patient information to issue receipts, performed audits of patient accounts to ensure accuracy and timely payment. Reviewed account agings on a monthly basis and reports inconsistencies, corrected the errors as appropriate. Contacted the patients regarding delinquent accounts and arranged mutually acceptable payment schedules. Demonstrated the ability to deal with patients regarding sensitive financial matters and recaptured the unpaid balances. Received and resolved patient billing complaints and questions, initiated adjustments as necessary. Followed up on all zero payment explanations of benefits and exercises all options to obtain claim payments. Reviewed appropriate files to identify deceased patients and estates, verified dollar amounts and filed estate to the appropriate court in a timely manner. Made appropriate financial arrangements for payment of patient accounts. Followed up to determine if payment arrangements are being met, contacted patients to resolve problems. Summary : Highly organized, detail oriented and highly motivated Patient Account Specialist with 13 years of experience in the Healthcare domain is offering the skills and experience necessary to perform administrative and clerical duties efficiently. 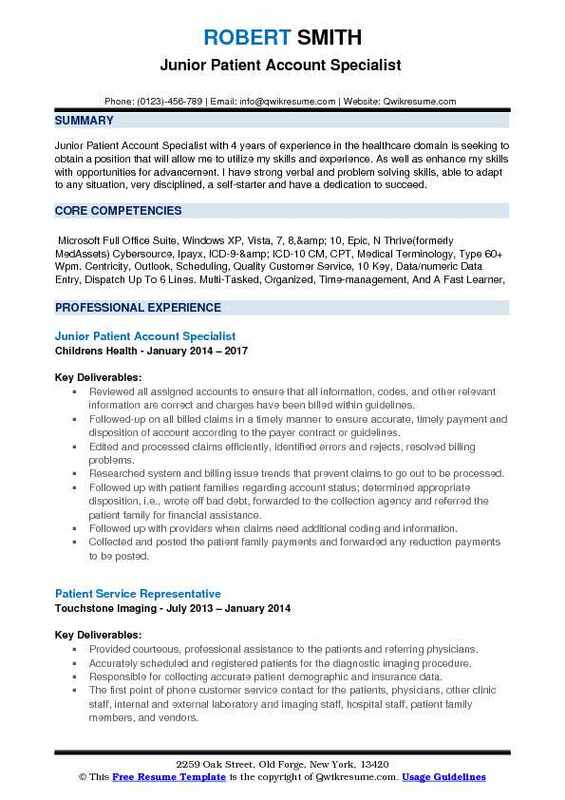 Skills : Attention To Detail, Internet Proficiency, Problem-Solving, Cash Handling, Inventory, Teamwork, Keyboarding Ten Key, Medical Terminology, Time Management, Excellent Customer Service, Computer Including Microsoft Word, Windows, Email, Etc. Working extensively with the E-intake proprietary system, maintaining accuracy and quality control throughout patient contact and data input. Receiving medical record documentation and providing a thorough review and quality assurance for physicians order, testing, progress notes, medical necessity and other documentation requirements for payers and regulatory bodies. Auditing file and proof of delivery documents to confirm products and services were provided, as ordered and all data entered in E-intake is accurate. Resolving errors by communicating and resolving with patients, referral sources and employees. Verifying the accuracy of the information in IMBs and E-intake compared to information on the required forms. Providing product/service information by answering questions, offering assistance communicates. Following successful QA, confirming charges in E-intake for billing to 3rd party entities and/or patient. Proactively obtaining re-certifications, re-authorizations, renewal orders as required. Providing timely resolution for accounts that are not in a payable status. Providing education to referral sources, patients and employees on qualifications for service and third-party billing. Building relationships with locations, patients and referral sources. Summary : Highly organized and detail-oriented Senior Patient Account Specialist with 14 plus years of experience in the Healthcare domain, experienced working in fast-paced environment. Strong communication, analytical skills and able to multi-task effectively. Ensured that billing is occurring in accordance with all applicable clinic procedures and standards. Identified and corrected the missing data elements prior to claims submission. Audited the claims prior to submission on the electronic system. Maintained working knowledge of the health plans with which the clinic contracts. Identified the internal and external sources to answer complex questions and resolved detailed problems. Monitored reimbursements received for the accuracy of contracted payment rates and regulations. Filed appeals on denied claims, insufficient payments and/or overstated disallowed amounts in a timely manner. Re-filed claims with additional supporting documentation to obtain higher reimbursement as necessary. Responded to carrier inquiries for additional information including contacting practices to obtain additional documentation to support resubmission of claims. Reviewed the audit reports ensuring that payments are posted accurately. Investigated billing problems and formulated solutions for review and implementation. Monitored payer reimbursement turnaround time of 30 - 45 days. Used information gathered in the monitoring process to notify insurance company and manager of inconsistencies. Identified claims payment slowdown notified the manager. Assisted in action to remedy. Summary : Detail-oriented Patient Account Specialist II with 16 years of experience in the Healthcare domain, with extensive knowledge of billing systems, medical terminology, and insurance practices. Performed root cause analysis, prepared and implemented action plans, and lead improvement initiatives. Responsible for supporting complex corporate-wide initiatives to ensure that revenue is generated. Generated and distributed various reports to support organizational revenue data monitoring and improvement initiatives. Researched, appealed, and resolved claims rejections, underpayments, and denials with appropriate payor within payor specified deadlines. Performed appropriate billing functions, including manual re-bills as well as electronic submission to payers. Determined coordination of benefits as required, maintained current patient account information at all times. Maintained confidentiality of all company and patient information in accordance with HIPAA regulations and company policies. Identified authorization, cash posting, and registration errors on patient accounts and routed to the appropriate. Analyzed payor metrics reports to proactively identify payor issues, developed recommendations for resolution. Participated in discussions with management regarding key performance metrics. Headline : Sr. 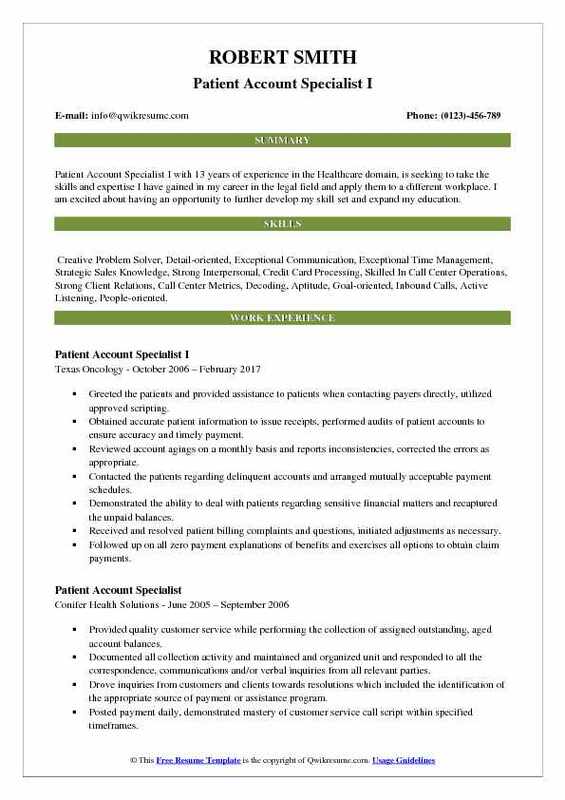 Patient Account Specialist with 6 plus years of experience in the Healthcare domain is seeking to obtain a position in the medical field, that will utilize my skills and provide an opportunity for advancement. Maintaining the patients’ accounts including verifying patient demographic information is populated, ensuring all guarantors are entered correctly, creating a supervision relationship or patient responsibility if appropriate, completing authorization reports, adding new payer information, verifying benefits, controlling patient balances, and verifying patients are scheduled with a participating provider. Contacting the insurance companies to obtain preauthorization, resolving outstanding balances, incorrect payments, claim denials or information needed to adjudicate claims. Working with clinical areas to resolve rejections and determine collectability or need for adjustment. Responsible for Medicaid/Medicare reporting. Ensuring that patients have necessary agreements on file. Offering or delegating administrative support including but not limited to the following tasks: greeting, answering questions based on knowledge, scanning and copying, letters of correspondence, monitoring clinical staff schedules (i.e. 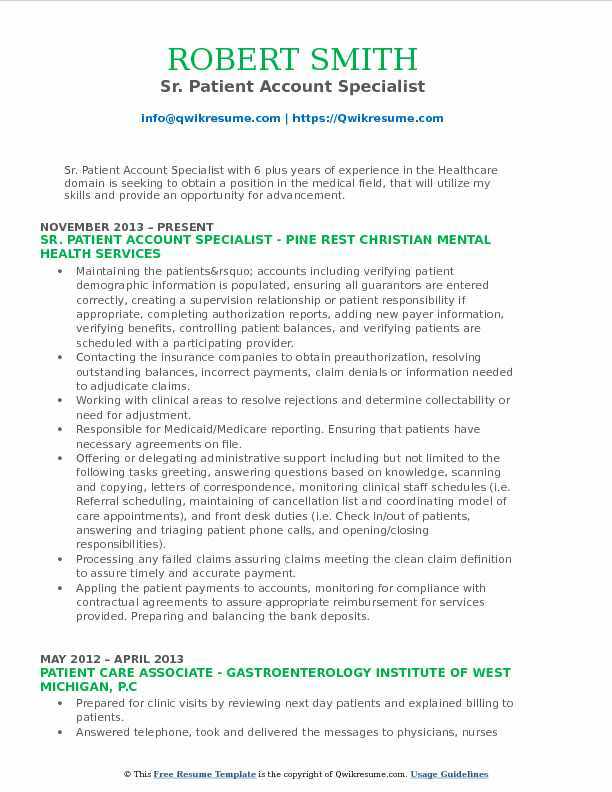 Referral scheduling, maintaining of cancellation list and coordinating model of care appointments), and front desk duties (i.e. Check in/out of patients, answering and triaging patient phone calls, and opening/closing responsibilities). Processing any failed claims assuring claims meeting the clean claim definition to assure timely and accurate payment. Appling the patient payments to accounts, monitoring for compliance with contractual agreements to assure appropriate reimbursement for services provided. Preparing and balancing the bank deposits. Headline : Patient Account Specialist with 5 plus years of experience in the Healthcare domain is seeking to procure a challenging position that will effectively utilize my professional experiences with opportunities for advancement. Serving as a Senior Patient Account Specialist within the administrative & business office, Virginia Cancer specialists, to include functions related, but not limited to, billing, account management, and customer service. Analyzing the data from a variety of sources to perform audits of patient accounts and ensuring the accurate and timely payments. Researching and developing solutions to account errors and monitoring the status to ensure issues are fully resolved. Communicating with patients regarding delinquent accounts and coordinating mutually acceptable payments schedules. Handling sensitive financial matters between patients and insurance companies with diplomacy and tact and recapturing the unpaid balances. Receiving and responding to requests from insurance companies, identifying and proposing solutions to issues. Reconciling the refund accounts and coordinating with management to process refund checks. Providing legendary customer service by receiving patient complaints, identifying the issues, and recommending appropriate resolutions. Preparing write-off requests with appropriate documentation and submitting to the supervisor. Reviewing the explanations of benefits to ensure proper reimbursement of claims and reporting any problem, issues, or payor trends to the supervisor. Summary : Eleven years experience in customer service. Versatile Patient Account Specialist Team Lead with a proven track record of resolving customer conflicts. Excellent communicator with effective presentation and management experience. Trained staff to be proficient and self-directed with the primary understanding that the customer always comes first. Skills : Excellent Customer Service Skills, Supervisory Skills, Office Management, Medical Terminology, Microsoft Office, Accounting Principles/Software Billing and Invoicing, Conflict Resolution, Collections, CPT & HCPC Codes, Modifiers & ICD-9. Reviewing all claims for the completeness, the reasonableness of charges, and appropriateness of billing codes, and payer information. Pursuing timely collection of each claim using thorough follow-up efforts appropriate to each payer. Reviewing, making corrections to and ensuring the legibility of outgoing secondary bills, and other correspondence before sending. Handling all incoming phone calls and inquiries in an appropriate manner. Contacting and effectively communicating with all parties involved in the resolution of accounts placed. Performing all tasks necessary to maintain current and accurate account information in each of the appropriate systems. Forwarding and log all documentation related to processes and duties which were transferred to other employees. Bringing problems and troubling accounts, as well as related questions, to my immediate the supervisor's attention daily. Exercising good judgment and makes sound decisions in the absence of detailed instructions or in an emergency situation. Treating the client request with a high priority. Quickly informing the supervisor and any other personnel needed to help carry out the request timely, accurately, and according to instruction. Striving to improve current operations by identifying inefficiencies and recurring problems, and by making suggestions to the immediate supervisor. 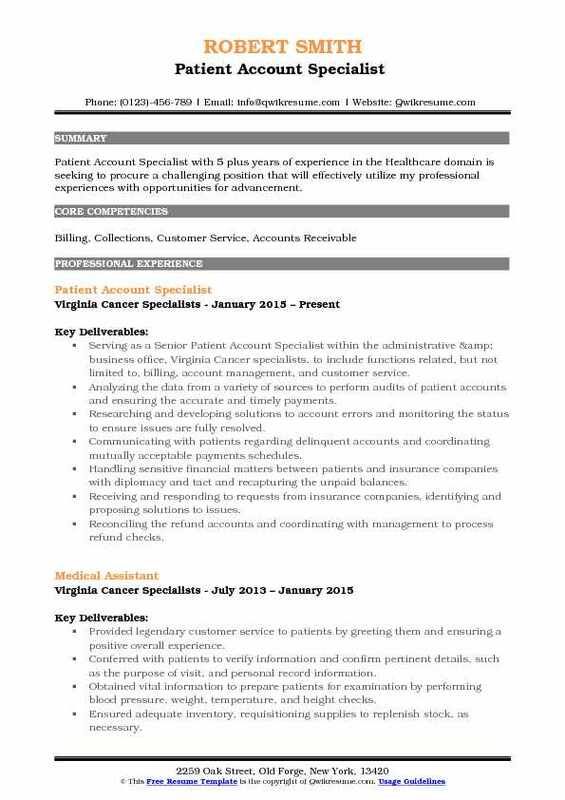 Summary : Patient Account Specialist IV with 30 years of experience in the Healthcare domain is seeking to be able to utilize my customer service skills of approximately thirty, twenty of which have been with Umatilla Family Practice, and knowledge of the medical field to effectively contribute to the success of your office. I am a dynamic and trustworthy employee and would love to help provide the best care to your patients. Skills : Good With Money, Numbers And People. Verified insurance eligibility and assignment for all incoming patients. Answered the phones and assisting patients with their needs: scheduled, answered questions regarding billing, took messages for the nurses/doctors, etc. Checked outpatients, collected payments, and balanced cash drawer at the end of each day. Copied all written prescriptions and orders for testing and maintaining a log of all tests. Faxed the order to facilities for scheduling and making sure all information required by the facility is received within the fax. Assisted with referrals, finding network providers for the patients' specific insurance plan, scheduled, or confirmed appointments as needed. Prepared the encounter forms for the next day, input all new patient information, and input all patient information changes. Assisted with retrieving medical records from FHW/CMI and lab results from Quest and Vista. 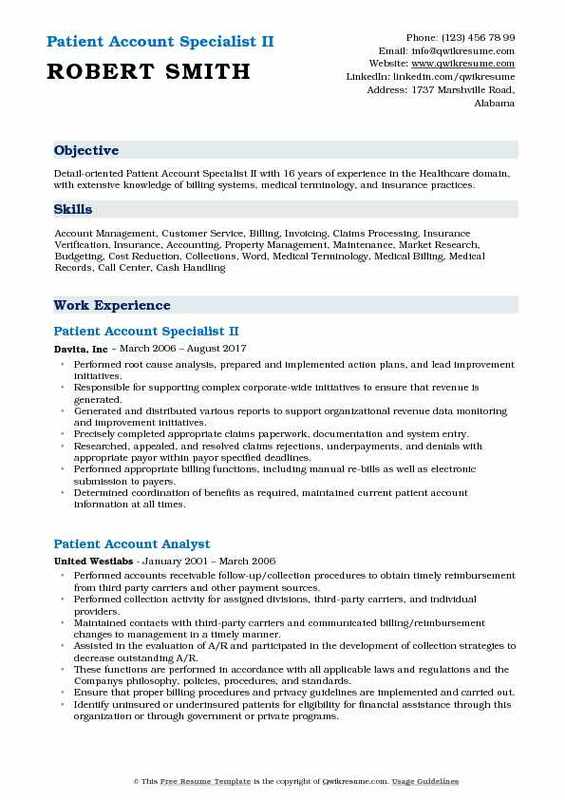 Assisted with all billing responsibilities: entered charges, posted payments, worked denied claims, collected patient responsibilities, and called to collect accounts receivable. Proficient in Medical Manager, Medisoft, Zirmed, Practice Fusion and Nuemd programs.